I have long ago in my mind to organize wine & movie nights. 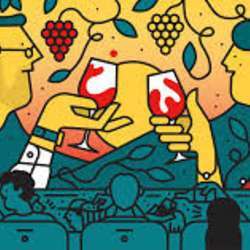 There are many-many films for wine lovers about the topic of the red passion! Let`s watch movies with a glass of wine… about wine. Gladly invite you to my cheeky little flat to watch a good film and enjoy a small selection Protected content of wine and a movie snack. As the space is very limited, I am able to accommodate 6 people for the night. Our first film will be the Sideaways – a black comedy drama directed by Alexander Payne. A film adaptation of Rex Pickett's novel follows two men in their forties, Miles Raymond (Paul Giamatti), a depressed teacher and unsuccessful writer, and Jack Cole (Thomas Haden Church), a past-his-prime actor, who take a week-long road trip to Santa Barbara County wine country to celebrate Jack's upcoming wedding. (10 € / person) :), to cover the cost for the wine, snacks and movie (as Amazon). Fair play! Please make sure, that your registration will be followed by your attendance! If you can’t make it, cancel, and leave the slot for others who would like to join. I hope, I`ll see many of you on this very nice new wine event.